The Handwritten Card staff sends a genuinely handwritten note from you. 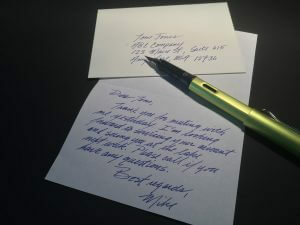 All of us at the handwritten card have a passion for the handwriting. More importantly this website is one that celebrates and values notes using the increasingly esoteric practice of writing with pen, paper and ink. Our handwriting service never uses any type of computer generated font or means to handwrite your message. Our writers understand that in today’s world with the ease of instantaneous free delivery of email correspondence notes done by hand are rare. Like most things that become rare, handwritten cards even more appreciated. We hope, in the face of all of this, the cumbersome method of writing notes on fine stationery, with a pen, and then folding them into an envelope, placing a stamp on it, and carrying it to a mailbox will carry on through this website. We understand modern demands have made it more difficult for many of us to take the time needed to pen a note. What a great feeling it is to receive a handwritten note in the mail. It is exciting to open a note when you see the envelop was written by hand. Opening an email or a printed envelope is a dull experience. Our cards and notes arrive as “real” in contrast to the regular assortment of advertisements and bills. The writers at The Handwritten Card can touch people’s minds by taking the time to write a note from you and make it special. See some of our samples. For five thousand years, the pen has been an indispensable tool of communication, lending cachet to private, social, and business life. Scribes of old dedicated their lives to the art handwriting. Today, machines can write well, but will never write with heart. The writers of our notes take care for the sake of who will receive it as much as a reflection on the one who sends it, you. We are passionate about your privacy, read our policy here.